After completing an intense hot power yoga class as in 90 minutes of twists, turns, constant movement, abs and more in a room above 100 degrees this smoothie is exactly what my body was calling for. I needed something to re-fuel my body of everything that was depleted. It was looking for protein, hydration, salt, and something extremely refreshing. Protein post work out is ideal to rebuild and repair the muscles that you just worked. I added a little honey and cinnamon to sweeten the smoothie and help fight inflammation and bloating. 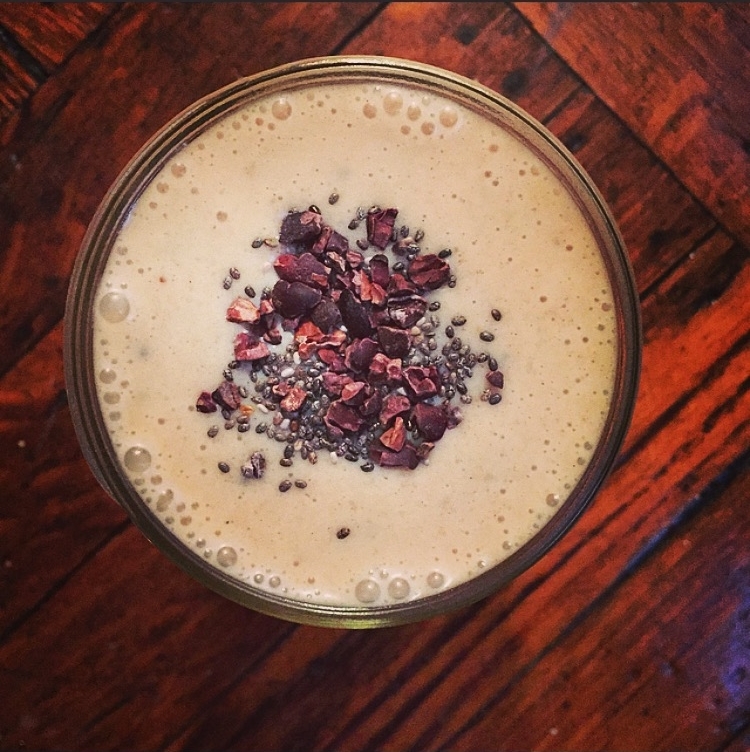 Then finished the smoothie off with cacao nibs for a tasty energy and instant mood boost! Add the almond milk, chia seeds, peanut butter, honey, and cinnamon to blend and blend on high for 1 minute. Next, add the frozen bananas and ice. Blend on high until well mixed- 2 or so minutes. Top with cacao nibs and additional chia seeds if desired. This shake has roughly 19 grams of protein and 20 grams of fiber. The high fiber content is great for those who are suffering from IBS as it can be necessary to get things moving! Be careful, not to increase your daily fiber suddenly as if can cause bloating or the opposite of what you want- constipation!